The Danish crown princess opened a new exhibition at The Natural History Museum Copenhagen. Source: Getty. 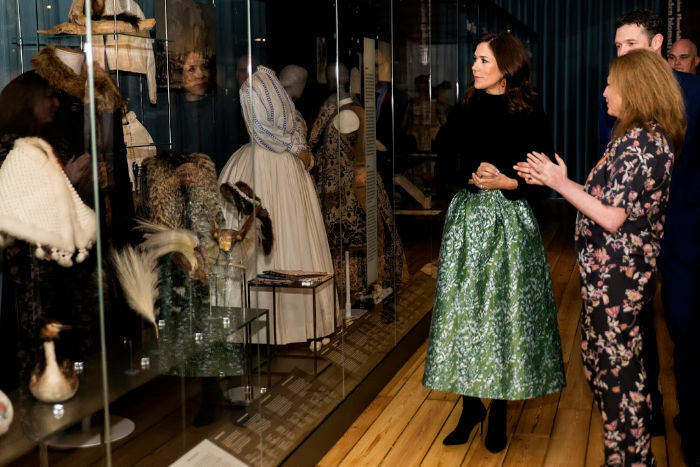 She is one of the world’s most fashionable members of royalty and Crown Princess Mary showed off her style credentials once again as she stepped out to open a new museum exhibition. The Danish royal was in the nations capital on Friday for the official opening ceremony of the ‘Fashioned From Nature’ exhibition at the Danish National History Museum. And the Australian-born princess mastered the art of stylish winter dressing as she paired a sensible, black high-neck knitted sweater and a pair of black boots with a vibrant green A-line skirt. Clearly inspired by the theme of the event, Mary’s stunning skirt was decorated with a white and black foliage design. She completed her elegant look with subtle smoky eye make-up and wore her raven locks loose in curls. The Danish royal is known for her impeccable sense of style. Source: Getty. Based on a similar exhibition from London’s Victoria and Albert Museum, Fashioned from Nature focuses on using nature’s own materials in the fashion industry and the effects on the environment of the industries current production methods and consumption habits. Earlier this week, Mary stepped out with her youngest children, twins Prince Vincent and Princess Josephine, as she treated the royal youngsters to a day out at Copenhagen Zoo. The 47-year-old royal had visited the zoo the previous day with her mother-in-law Queen Margrethe II for the official opening of a new panda facility which houses pandas Xing Er and Mao Sun. The pandas were gifted to the zoo by the Chinese Government on a loan basis as a symbol of friendship between the two countries. In one image the twins can be seen looking intently into the enclosure to view the pandas adjusting to their new home. While another photo shows Mary standing proudly alongside her two kids with the new area behind them. Are you a fan of Princess Mary? Would you like to see her return to Australia on a royal tour?